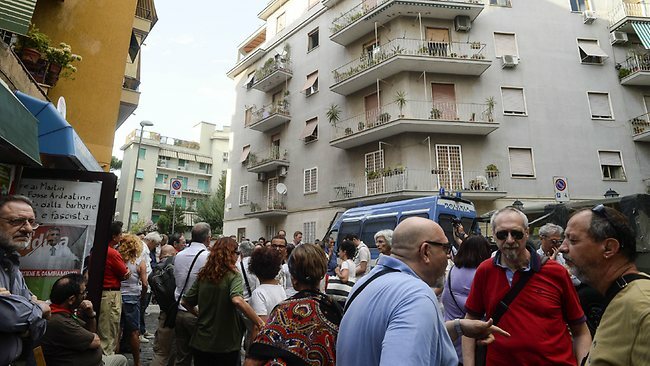 SCUFFLES erupted outside the Rome home of Erich Priebke on Monday as one of the last living Nazi war criminals celebrated his 100th birthday. Police had reinforced security at the address where Priebke is under house arrest, but the measure failed to prevent minor clashes. Several dozen demonstrators from the Jewish organisation Project Dreyfus were at the protest, confronting a family member of the former SS captain, identified as Priebke's grandson, when he arrived with a bottle of champagne. Insults and a scuffle followed and the man was eventually led to safety in a police car to avoid the angry protestors. Priebke was sentenced to life in prison in 1998 for his role in the massacre at Rome's Ardeatine caves in March 1944, which left 335 people dead, including 75 Jews. They were executed with a bullet to the neck, killed by the Nazis in retaliation for an attack by the resistance movement on SS soldiers. The former officer had been arrested in 1994 after fleeing to Argentina at the end of World War II. He had lived there for more than 40 years before being extradited to Italy in 1995. In 1998, he was sentenced to life imprisonment for his role in the massacre. A year later he was allowed to serve out his sentence at home because of his advanced age and ill-health. In April 2011, the Italian magazine Oggi sparked a scandal with photographs showing the former Nazi officer dining at a restaurant with friends, riding a motorbike and shopping at a supermarket. Hail Priebke! It is unfair to imprison him for things he did during war. War is hell. The alloes are worse war criminals but they get away with it because of the jews. Screw project dreyfus! The harrassment of National Socialists is nothing less than discrimination and intolerance.